Danielle Starr, BEng MSc1, Monique Y. Rennie, PhD1, Garrett Vermey, BEng1 and Rose Raizman, RN-EC MSc PHCNP CETN2. 1MolecuLight Inc, Toronto, ON, Canada, 2Scarborough & Rouge Hospital, Toronto, ON, Canada. Presented at CAET 2017. Proceedings of the Canadian Association for Enterostomal Therapy National Conference; 2017 May 25-28; London, ON, Canada. Accurate, rapid tracking and documentation of wound size is an important component of wound care. Size has traditionally been determined using a wound ruler to measure wound length and width. However, this approach frequently overestimates wound area and is difficult to consistently measure when wound shape changes. 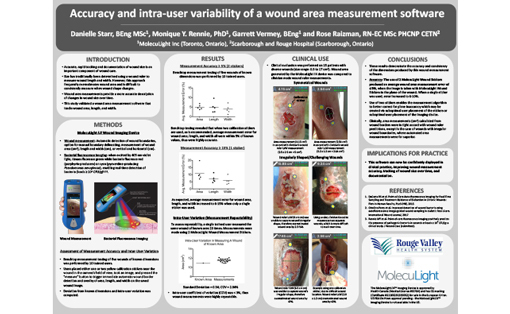 This study validated wound area measurement software that tracks wound area, length, and width. 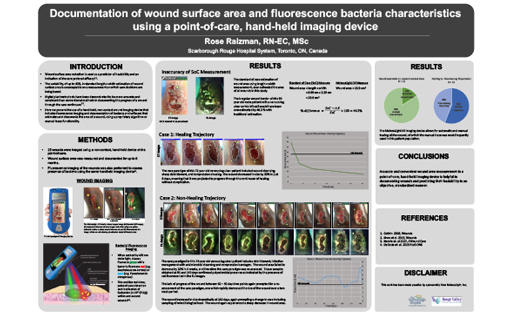 Benchtop measurement testing of five wounds of known dimensions was performed by 10 trained users using the MolecuLight i:X Imaging Device. Users placed either one or two calibration stickers near the wound in the camera’s field of view, took an image, and pressed the “measure” button to trigger immediate automatic wound border detection and overlay of area, length, and width on the saved wound image. Deviation from known dimensions and intra-user variation was computed. Clinical evaluation was performed on 15 patients with diverse wounds, and wound dimensions compared to ruler measurements. Benchtop testing revealed that when two calibration stickers are used, as is recommended, average measurement error for wound area, length, and width all were within 5 % of known values, thus were highly accurate. Intra-user coefficient of variation was < 3 %, thus wound measurements were highly repeatable. Average measurement error increased to 6-10 % when only a single sticker was used. Clinically, area measurements (range: 0.3 to 17 cm2) calculated from wound borders were in tight accord with wound ruler predictions, except in the case of wounds with irregular wound boundaries, where automated area measurements were far superior. 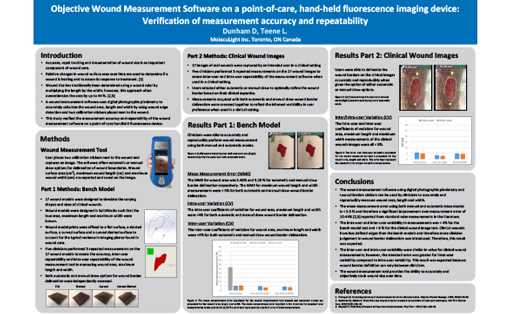 These results demonstrate the accuracy and consistency of wound measurement software dimensions, as well as the superiority of using area measurements in wounds of irregular shape. This software can now be confidently deployed in clinical practice, improving wound measurement accuracy, tracking over time, and documentation.